Owner Rick Twamley, fishing aboard his 60-foot Hatteras Bull Rider, made a first and lasting impression by boating a 427-pound blue marlin on the first day of the 2016 Bisbee’s East Cape Offshore Tournament. That fish captured on a green and yellow dorado lure after a 68-minute fight, earned Capt. Lucas Parelta and the team the top payout of $340,701. The total purse among this year’s 65-boat fleet was $543,825. Kona skipper Mike Hennessy teamed up with Capt. 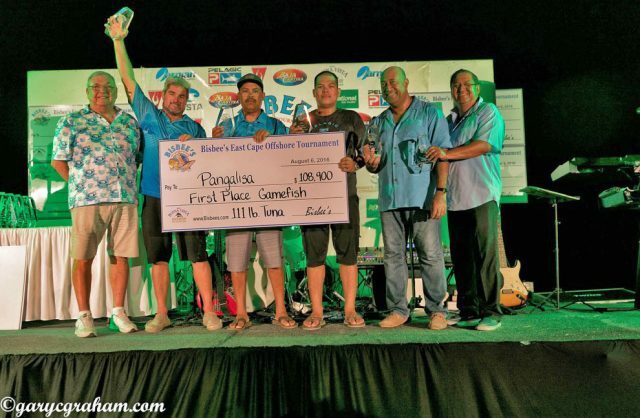 Gonzalo Castillo, angler John Dominac and the Pangalisa crew for another six-figure payout. 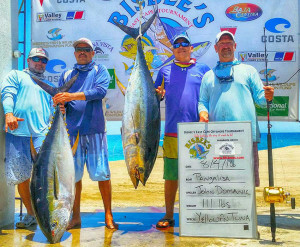 The 111-pound yellowfin wound in by Dominac took the heaviest tournament and gamefish categories, along with a rollover of the dorado jackpot money, good for $108,900. Pangalisa is a 32 Edgewater center console with Jose Castillo working as the mate. Michael Loynes cranked in the only other qualifying marlin (300-pound minimum) at 316-pounds. With the second place tournament award and rollover jackpot money, Capt. 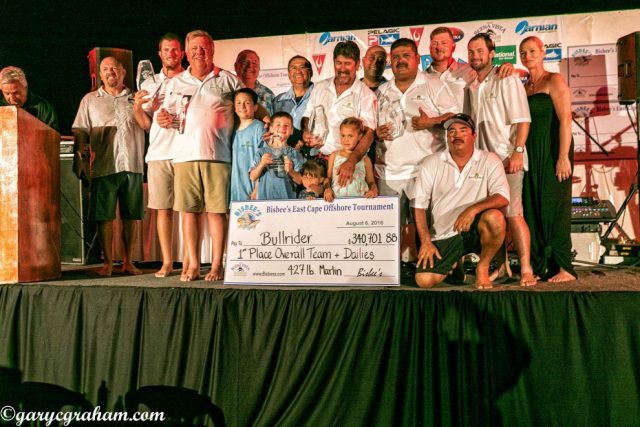 Vicente Cosio and Team Viva Boyz earned $58,523 for the catch aboard the 32 Albemarle, based at the host facility, the Hotel Buena Vista Beach Resort. Catch and release cash jackpots were added to this year’s ECO, which was perfect timing considering the steady billfish bite. A total of 112 blues, one black, 36 striped marlin and 14 sailfish were recorded. Released fish were scored 300-points (blues and blacks) and 100-points (striped marlin and sailfish). Reel Quest, a 68 Hatteras led by Capt. Ty Valli and mate Jose Antonio Bojorquez, won top release team honors and a check for $23,205 for releasing five blues and one striper. Hooray, an 80 Viking with Capt. Francisco Bojorquez at the helm, came in second in the release category with four blue marlin, a sailfish and striped marlin, good for $8,032. 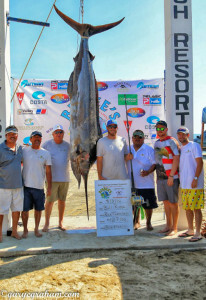 El Suertudo, a 61 Viking, was third with four blues and one striper tallied. Capt. Greg Distefano and his team earned $4,462 for the week.